Now i don't often wear t-shirts but this is brilliant! & at only £12.99 for a ladies size i really really want it! 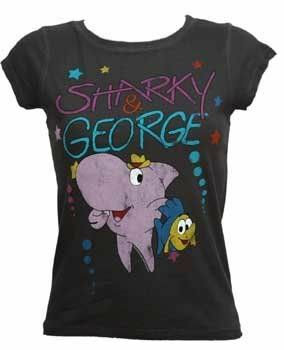 omg sharky and george the crime busters of the sea !! oh jeez i've just remebered that theme tune and cant get it out of my head!! OMG! where did u get this its so cool! I love sharkey and george brins back memories.